Looking for buy a villa en el Portet of Moraira? We have a lot of villas for sale in El Portet in this section and private villas. Ask us to get more information to buy your villa with the best conditions. This large detached villa is located within a small community within walking distance to Portet beach. Accomodation is divided in two apartments, the main house is located on the top floor with flat entrance from the parking, on this floor there are 3 double bedrooms, 1 family bathroom, separate fully equipped kitchen and a large living/dining room with Access to terraces on both sides. On the lower level there is separate parking, open plan living/dining room, fully equipped kitchen, 2 bedrooms and 2 bathrooms. At the back of the apartment with external Access there is a spacious store/utility room. Property benefits of gas central heating, double glazed Windows, communal pool heated by solar panels and it's walking distance to the popular beach of Portet. 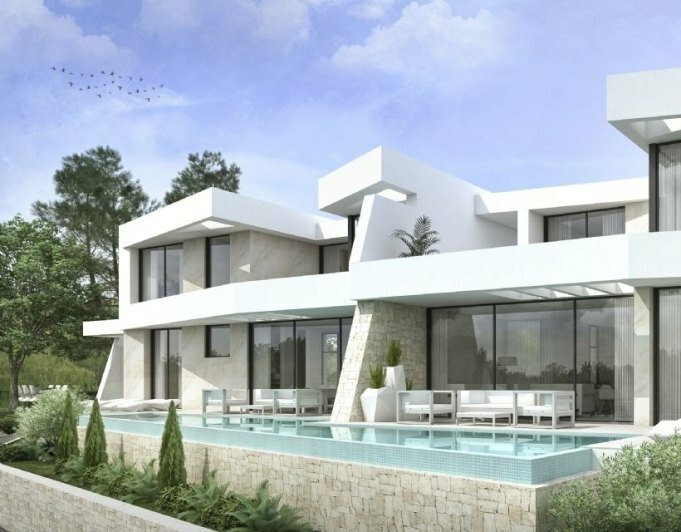 Two new villas for sale Pla del Mar, Moraira. This beautiful Villa in El Portet has recently been reformed to a very high standard, set on a large 1015m2 fully gated plot this villa benefits of total privacy. Access is through the pedestrian gate that is within the carport area with room for 2 large cars.Accommodation is set all on one level. The property is accessed through a set of double glass doors that lead into the round shaped dining room which opens to the modern fully equipped kitchen and to the open plan living room with featured fire place. From the living room a hallway takes us to the 2 double bedrooms, 1 family bathroom and at the end we have a large master suite with dressing area, large ensuite bathroom and double doors out to the large terrace.On the lower level the property has a big covered naya on level with the pool which accommodates various sitting areas, dining area, outdoor bar/summer kitchen, shower room and access to a large underbuilt space which could be developed into more accommodation, currently used as storage and pool table room.To the other side of the pool there is a beautiful wooden cabana with seating area surrounded by a big variety of palm trees and greenery.Property boosts double glazing throughout, covered parking for 2 cars, gas central heating out, private 8 x 4 kidney shaped pool and a short walk down to El Portet beach. 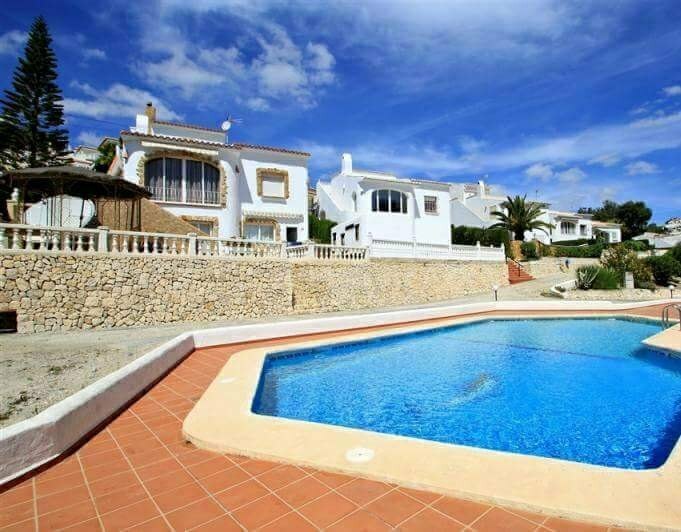 This is a delightful villa set in the sought after area of El Portet, Moraira. 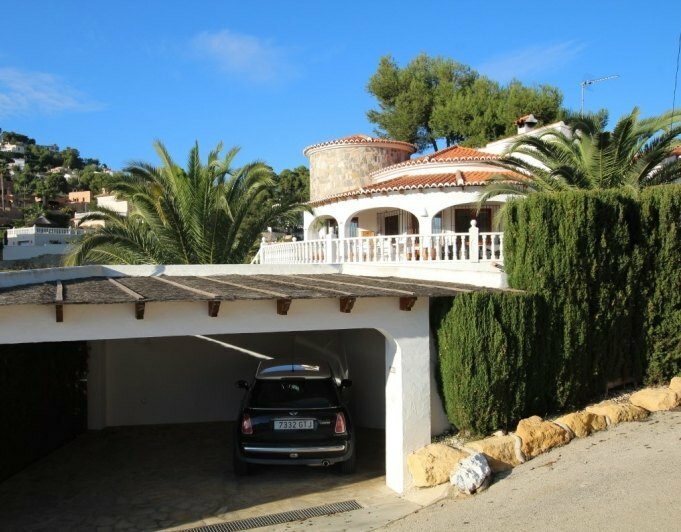 This is a well maintained three bedroomed villa within a short distance to El Portet beach (728m, walk)As you entre through the automated driveway gates there is a large driveway and parking area providing ample parking for up to 78 cars. Within the same area there is a large storage area providing practical storage for garden equipment and general storage items.Entering from the principal entrance into the property there is a large internal hallway that provides access to the large lounge, kitchen and guest bedroom. Also the staircase providing access to the first floor master bedroom.The Kitchen is full fitted with built in appliances. Off the kitchen is the large and bright lounge featuring a centre fire place and has access out to the garden Nya/Terrace, An ideal area for alfresco dining and shelter from the south elevating sun.To the rear of the lounge is a good sized guest bedroom with build in wardrobes and benefits from a central ceiling fan.The second guest bedroom and principal bathroom is found to the rear of the villa with the Master bedroom and ensuite found on the first floor. The Master bedroom has a large balcony with open and sea views.The garden is wellmanicured and very private with a 8m x 4m swimming pool along with an artificial lawed area and antslip terracing. The garden area also benefits from an outside shower/WC room, Summer kitchen/BBQ area. There is also a chill out timber gazebo area.This property doesn’t only look very attractive during the day but also by night with outside lighting affect. 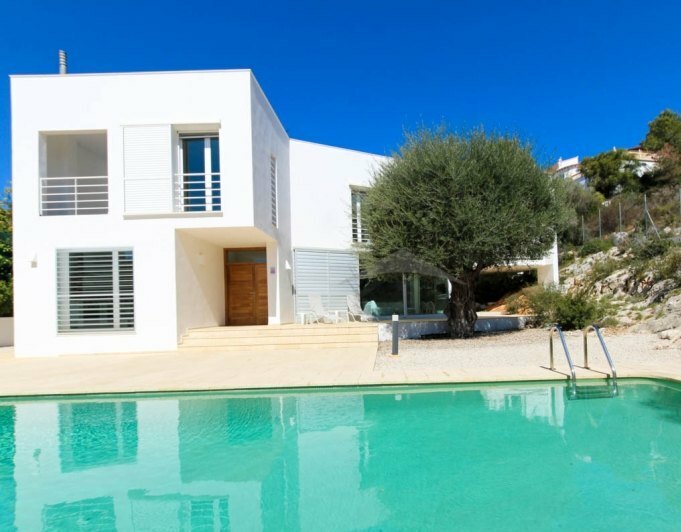 Well situated in El Portet Area, this contemporary property offers stateoftheart design and top quality finishes. Comprising 260 sq m , of lightfilled comfort, this fourbedroom jewel offers a livestyle of sophisticated elegance. Double ceilings add to the open feel that defines the interior. The great room, with its living & dining areas has an ideal flow for entertaining. An entire wall of glass infuses the space with light while drawing the eye to the garden views. The sleek modern kitchen is equipped with stainlesssteel appliances. Other highlights include parking space, automatic gates, and a location just a short walk to El Portet beach. This luxury property is set within a quite Cul de Sac in the exclusive area of El Portet in Moraira, only a short drive to the beach and the town.Access is via the electronic sliding gate which leads up through the driveway to the ample parking and the garage, from the garage an elevator take us to the fully equipped modern kitchen, the accomodation comprises 4 double bedrooms, 4 bathrooms and a gymnasium.Outdoors we find a beautiful large rectangular heated pool with cover overlooking the mediterranean sea surrounded by a big terrace, next to the pool we also find the outdoor shower and sauna. The property boasts double glazing throughout, lift, sauna, heated pool, garage, central heating, airconditioning and the most impressive sea views. Beautiful Ibizan style villa situated only 600 metres walking distance from the beach of El Portet.This stunning classical villa has been constructed to a very high standard using only the finest materials. Featuring traditional open beams and hand made floor tiles. A large spacious villa with an open and bright aspect overlooking the stunning pool and terrace. Four large double bedrooms, dining room, lounge, kitchen, private parking. This is an ideal family home and a perfect holiday home due to the sought after location. This is an impressive villa set on a large flat plot. As you enter through the grand automatic gated driveway there is a court yard area with ample parking and access to the main villa and also a guest apartment consisting of one double bedroom with built in wardrobes and an ensuite bathroom.Entering into the main villa there is an entrance hallway that gives way to two large bedrooms one with an ensuite and dressing room. Continuing along the hallway there is a guest bathroom and a Utility room. Leading up the stairwell onto the first floor and the main living level there is a double bedroom with an ensuite bathroom and dressing room, along with the fully fitted spacious kitchen, dining room and sizable lounge. Both areas have large feature open fireplaces. From the lounge there is direct access out to the garden/pool area. From the dining room there is a stairwell leading up to the third floor level which consists of two double bedrooms with ensuites. One of these bedrooms has access out to a large roof terrace. On this same level there is a separate lounge.The Garden area is an extensive flat private area with mature plants and trees set around the 12m x 6m heated swimming pool with integral jacuzzi. There is a fantastic summer kitchen/BBQ which is fully equipped and can be opened or closed off with shutters. This along with the Jacuzzi on the upper sun terrace provides delightful areas to enjoy the Spanish lifestyle.Extras:Gas central heating.hot and cold airconditioning.Double glazing.Heated pool.Jacuzzi.Large private plot.Sought after area. One of the most stunning front line villas for sale in El Portet with panoramic sea views.This front line villa stands at the end of a cul de sac with breathtaking uninterrupted sea views. Its unique position borders the protected headland and is generally thought to be the no 1 plot in the area. The beautiful, sunny, extremely private 4/5 bedroomed villa is built on 3 floors and has undergone a total refurbishment to a very high standard. Access to the property from the road level is either through a pedestrian gate with electronic key code or via the car port with electric shutter. A path and stairs lead through the terraced garden with palms, mature plants with full irrigation system up to the main entrance. Entering the villa through the oak door into the entrance hall, with telephone point, gate intercom, cloakroom with wc and wash hand basin, and separate coat hanging wardrobe. Leading from the hallway is the open plan living, dining and kitchen area, with panoramic sea views through windows along the length of the villa. Bose sound system, tv points. The stunning modern fully fitted kitchen has neff appliances including american fridge freezer with water dispenser and ice maker, 6 ring induction hob, integrated dishwasher, oven and separate microwave. Liebherr wine fridge. Numerous units and drawers for storage and central island with extractor unit above. From the dining /kitchen area french windows lead out onto the naya, with ample space for outdoor dining table and chairs and sofa area, outdoor speakers are fitted. An outdoor staircase leads down to the pool area from the naya. Back into the main entrance hallway, staircases with stainless balustrade lead up to the master bedroom suite or down to the guest rooms and pool level. The master suite comprises a very large bedroom, beautifully fitted en suite bathroom with walk in shower, free standing bath, vanity unit with double sinks, bidet, toilet and wall hung vanity storage unit. Separate fully fitted dressing room with solid light oak hanging units, drawers and shelving. There is a further room, which is currently used as an office, but could be used as a nursery/ children's bedroom. 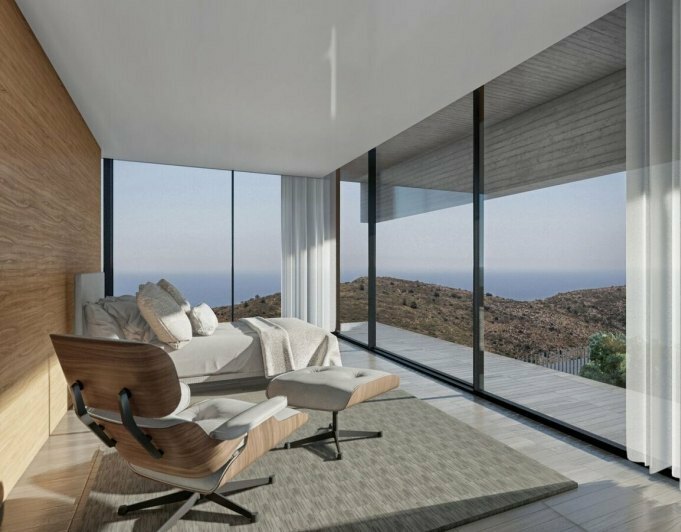 From the master bedroom french doors lead onto an L shaped terrace, again taking advantage of the spectacular uninterrupted sea views. Returning to the main entrance hall, a staircase leads down to the lower floor where there is a further hallway with a beautiful tosca stone feature wall running the length of the villa. 2 fitted linen/ storage cupboards are in this area. From this hallway are 3 generous double bedrooms, all with built in wardrobes. 1 ensuite with walk in shower, toilet and vanity unit with double sinks. A further bathroom has walk in shower, vanity unit and wc. All the bathrooms have electric towel rails and the house is fully air conditioned with hot and cold units and a gas run central heating system is also installed throughout the house. A laundry room is also situated on this floor with plumbing for washing machine, tumble drier, further fridge, sink unit, storage cupboards and houses the boiler for the central heating system and hot water cylinder and water softening system. All the guest rooms lead out through french doors onto the pool terrace. The pool is 11 x 5m and is newly tiled and grouted and is run with a saline system rather than chemical. This whole area is surrounded by a stainless balustrade. There is further shower room with wc and wash hand basin by the pool. A gate from the pool terrace leads down to the pool room, and separate storage room. If you want to enjoy one of the best areas of Moraira. The Portet is without a doubt your best option. We have the best villas for sale in El Portet where you will enjoy a unique and exclusive environment. 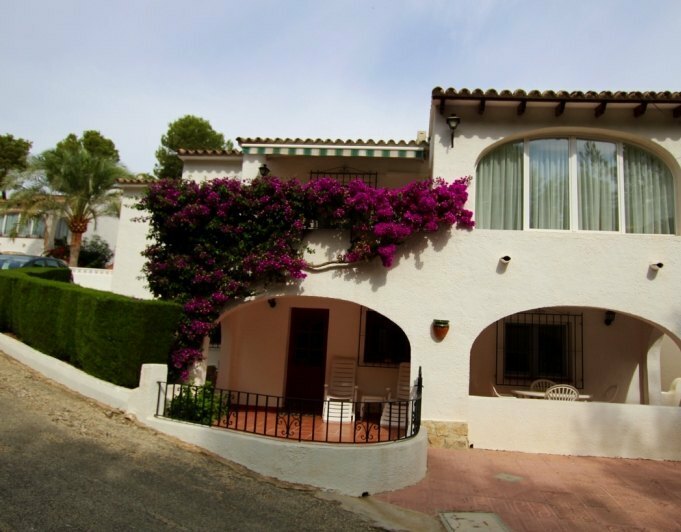 In Costa Blanca Dream Home you will find fantastic villas for sale in El Portet - Moraira. Houses that will make you enjoy the climate, gastronomy, culture and magical surroundings that the Costa Blanca has to offer. 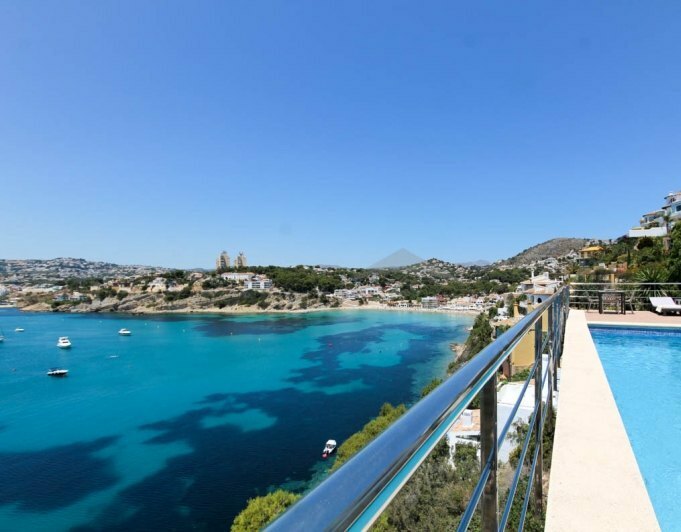 In this section you will find the best selection of properties for sale in El Portet, all personally selected by our team. El Portet in Moraira is a very popular and exclusive area where the best villas and properties in Moraira are concentrated. Due to its surroundings, the famous El Portet beach and the restaurants and services offered there, it is permitted to buy a property here that is considered exclusive. Moraira's climate is one of the main reasons why many of our clients decide to buy a property. The mild temperatures all year round make Moraira one of the best areas to live all year round on the Costa Blanca. Our properties in the Portet are characterized for being modern, elegant and with typical Mediterranean style where we can also find modern and spectacular villas with minimalist and elegant tones. In addition, the quality of all homes that we put at your disposal in the Portet is high where most have swimming pools and beautiful sea views. This and much more awaits you in each of our villas for sale in El Portet. Discover all the villas for sale in El Portet that we have on our website. We also have private villas in El Portet that you can not miss. Ask us!